"Mentality" continues to be a brick wall for the young starter who is full of ability and promise, yet can't get out of his own way or overcome injury problems. ST. LOUIS — At the 2018 Winter Warm-Up, Yadier Molina was asked what Carlos Martinez needed to work on in order to reach the upper echelon of starting pitchers in the Major Leagues. In one word, the St. Louis Cardinals catcher responded: "Mentality." Over a year later, those words ring truer than ever, with Martinez going through pains of all sorts as the 2019 season ramps up in Jupiter. Last month, he had to be shut down after a quick throwing session due to tightness in his right shoulder. The same limb that gave him lots of trouble last season, cutting his work in the rotation short. What started out as a two-week wait and see diagnosis has just found itself with two more weeks added on this morning. Martinez is no longer a pitcher you can slot into the opening day rotation, and there are doubts on whether he will see a start in April or May. Physically, the shoulder just isn't right, so the team is being cautious. But it's hard to not include the other aspect of this slow-moving debacle: Martinez's mental makeup as a starter in the big leagues. Ladies and gentlemen, this has nothing to do with hairstyle, and everything to do with preparation and dedication to your job. Last season, Derrick Goold of the St. Louis Post Dispatch reported that the team's decision to shift Martinez to the bullpen revolved around not only the fact that getting him back to 100% starting health was unlikely but also a flaw in Martinez's preparation between starts. It's not just climbing the hill every fifth day and throwing 100 pitches; one must do the work in-between that gives them that ability to be ready. With Martinez, there were doubts. This spring, the team was disappointed in Martinez's lack of preparation over the offseason. In other words, getting the shoulder in proper shape and keeping the health of it intact. Martinez decided to lift heavier in the gym instead of heightening mobility with the injured shoulder, so now he finds himself out of rotation spot, and at the moment, out of a role on this team. He will possibly start throwing in two weeks, which would be him towards the end of March. As Martinez gets loose, the Cardinals will begin the 2019 season. That is not ideal. Here's the thing. In this league, it takes more than pure skill and talent to make it work and take the next step. Martinez's arm has never been in doubt, but his mental makeup on a baseball field has never left the conversation. People will wildly attract this worry to his current haircut, but that doesn't really matter. It's fun, so Cardinals Twitter makes good use of it during a long season. The real problem has always been the focus on Martinez. Off the field, he's had a few slip-ups, and now, he's having one that could jeopardize his season. His inability to treat the shoulder soundly could cost the team wins. With no offense to John Gant or Dakota Hudson, they are a dry and improperly cooked sirloin steak compared to Martinez's juicy ribeye of talent. There's no discussion or debate there, or let's hope not. Gant can pitch out of his mind, and still not come close to being a #3 starter on this team. Same for Hudson this year. Or Austin Gomber. Or Daniel Ponce de Leon. It's just facts. There's a strong possibility that when the team meets with Martinez on March 27 to discuss his next step, the bullpen could be his landing spot. And while it's fun to imagine teams dealing with the likes of Alex Reyes, Jordan Hicks, and Martinez late in games, the best value for the 27-year-old arm nicknamed "El Gallo" is the rotation. That's where he gives the team the most value this season or next. Somehow, we have reached this point. A place where few want to truly dig into the reasons why we have arrived at this unfortunate marker. You can believe in the off-field issues or not, but they aren't going away. Couple that with the injured shoulder that isn't healing, and it starts to get complicated. If Martinez is ready to go at the end of May, but Reyes is as well, the team may have a tough call to make. The MRI on the shoulder has been clear so far of any long term damaging injuries, but could easily linger on if the player and team don't handle it properly. Under contract and still a vital asset to the team, finding a sound future for Martinez right now will be tricky. Personally, I'm fine with Martinez going into the bullpen, especially if the preparation issues are legit. The Cardinals need all the help they can get in the rotation and on this team to overtake the Chicago Cubs and Milwaukee Brewers for the division. They need all the firepower one team can handle to hold off the Cincinnati Reds, who may sneak up on the division the way Milwaukee did two years ago. Finding the right spot for Martinez right now is paramount. I argued on this site for Martinez to be a starter just last month, but we lived in a different world back then. A world that didn't involve the pitcher missing a month of spring training to figure out a throwing plan for his shoulder. Maybe it's all physical. Maybe it's not. Either way, Martinez needs to pitch, and the Cardinals need to figure out where he can best help them in 2019. This is where ego and salary go out the window, and accountability dictates the pace. 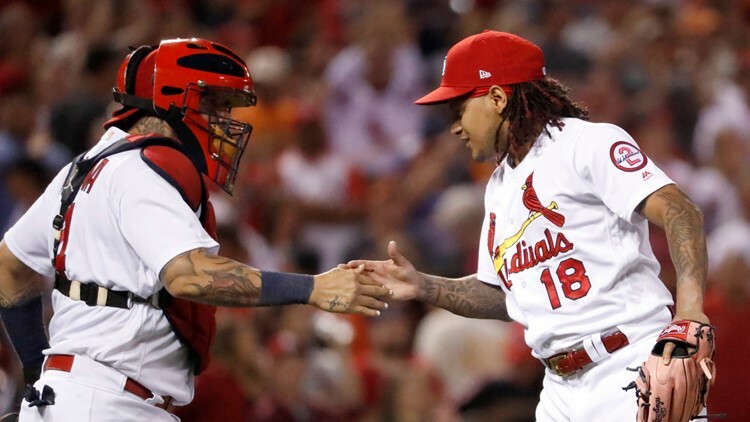 I can't tell you what Carlos Martinez will do in 2019, but I'm still hoping by mid-season, he's starting games and not slowly accumulating 35 innings of relief. I can tell you the decision for the Cardinals won't be an easy one, now or in June. Six years later, "mentality" is still something Martinez has to work on.